This was quite an interesting review as site and smell aspects of this review were some of the best I've done, yet the flavor didn't match up. 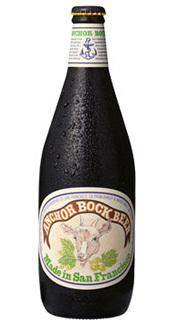 Anchor is no slouch when it comes to making some incredibly flavorful beer, however I think more of a balance could be struck with this Bock style beer. Appearance: Poured a very murky brown with chestnut highlights. Much darker than what I was expecting. The two-finger, billowy, off-white head stuck around quite a while before finally fizzling down to a thin ring of lace that sat on top of the beer. This is one really good looking beer. Smell: The smell was sweet as expected but surprising complex. Notes of toasted malts, dark fruit, molasses and brown sugar come through first then give way to a nice citrus hop resin with a touch of smokiness. This is one of the best smelling bocks I’ve come across to date. Fantastic. Initial Taste: Since the smell of this bock was so unique and complex one would assume those qualities would carry into the taste. And one would be correct, to a point. The sweet flavors we noticed in the smell are very prevalent in the initial taste; caramel, dark fruits (plums, figs and raisins), chocolate and burnt sugar. The mouthfeel was smooth and a bit slick but the high carbonation made it feel a little too thin. Sadly that nice hoppy citrus resin we found in the smell never really made it’s way into flavor. The finish does have a slight citric yet smokey bitterness but it’s not really a match for the sweet ingredients. I’m happy to see I am not the only one who has issues with this beer. And I LIKE big malty beers.